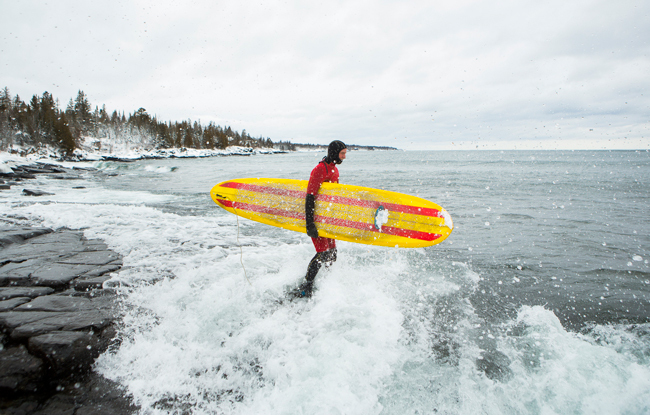 Crack photographer Derek Montgomery captured some great photographs of surfers on Lake Superior for this story on last night’s All Things Considered. As you can probably surmise from that photograph, Montgomery wasn’t standing on dry land. I asked him about what he had to do to get the shot. “It’s a little tricky since the shore isn’t sand, but a mix of snowed-over large rocks, snowed-over iced rocks and rock crevasses that are also snowed over. The crevasses aren’t deep, a few feet at most. But it’s enough to make you wary about each step since I could easily see myself rolling an ankle. Once the guys make it through all that, they arrive at their launching point, which is an area about 100 yards off to the side of where the waves are breaking. “The area where the surfers launch from is a gradual slope into the lake. They launch off a large, relatively flat rocky surface. You could shoot that from shore, but then you’d get a lot of ice and rock in the foreground. To get what it really feels like to be a Lake Superior surfer, you want to go out as far as you can without getting knocked over by some of the large waves crashing around you. I’m pretty brave, maybe stupid, since I’ll go out into water up to my knees to get a good shot, and that’s what I did with many of the shots of guys like Eric Wilkie, Mark Anderson and John Benzick when they set off into the lake. As you can see in some of the photos, there are large waves crashing around, and I think braving the waves and the cold water is the only way to really show what these guys are experiencing. “To get these types of shots, ideally you’d have waders to keep the water off your body. Unfortunately, I didn’t have those when out following the surfers. I had waterproof boots and water-resistant snow pants, which helped with the spray, but didn’t help when big waves rushed in up to my knees. At that point, when the water was pouring into my boots, I really wished I had remembered to bring my waders. Make sure you check out this full gallery of the surfers. And if you can’t get enough of those crazy surfers, here’s a video Erik Wilkie, one of the surfers, put together the day our reporter and photographer were out on the lake. Newer › What’s that on your forehead? We sure had a blast with the visit from you MPR guys Dan and Derrick ! Thanks for featuring us surf cats and the vid short post too ! …come back and visit anytime, we’ll have that wetsuit ready for you to get wet in next time, if you like ! keep having fun….